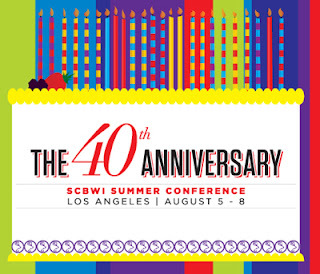 August 5-8th, 2011 in Los Angeles! New Format! August 5-7th: Conference! Editors, Agents & Art Directors! The 40 WINKS Saturday Night Poolside Gala! SCBWI TEAM BLOG live conference coverage! Today I turn my blog over to HarperCollins/Walden Pond Press editor Jordan Brown as he interviews author Chris Rylander about his THE FOURTH STALL, a Diary-of-a-Whimpy-Kid-meets-The-Sopranos debut middle-grade novel about friends Mac and Vince who run an advice and assistance service for fellow students out of their office in the boy's bathroom. Here Jordan and Chris talk voice, humor, character and a little baseball. Jordan: When I talk to people about the book, I will invariably mention that Mac’s is perhaps the most authentic middle grade voice I’ve ever read. Where did it come from? What were the most important parts of your process in crafting the narrative voice in THE FOURTH STALL? Chris: Well, when I hear people use words like “crafting” or “creating” in relation to Mac’s or any of the characters’ “voices,” it kind of makes me laugh, or at least grin a little bit. Because there really was no definite process or conscious effort to create an authentic or real middle grade voice. At risk of sounding smug or something, I have to admit that it really just came totally naturally and kind of easily for me. And that’s probably why it seems so authentic--because it kind of is. I don’t think you can manufacture something that feels completely authentic to the experts (who in this case are the kids), or at the very least it would be extremely hard to do. I think it all comes down to the fact that my mindset is still back there in 6th grade in a lot of ways, and it always will be. I still love toys, Lego’s, Nerf guns, video games, and being immature in general, such as, you know, giggling when some says the word “duty” or something; and it’s hard to imagine myself ever really outgrowing any of that stuff. So when I started writing this book about sixth graders, it was very easy to put myself back into a sixth grader’s shoes. It was the sort of thing I should have been writing all along because it’s where I’ve felt the most at home as a writer. I really wish I could give a more visceral answer other than me basically saying, “well, it just sort of happened on its own,” but, essentially, that’s exactly how it happened. Jordan: I love that this book walks line--presenting a true middle grade crime/noir story without slipping into parody or being overly stylized. Was this a conscious decision? What kinds of choices did you find yourself making along the way to keep things on this side of realistic? Chris: Yeah, it kind of was. But, also, not really. I mean, on the surface I actually don’t think a whole lot about what I’m writing when I’m getting started. I know that sounds like a stupid thing to admit (especially to your editor, ha-ha), but I really write more by feel than in a cerebral way. So I never came to a point where I made these definite decisions about how my story was going to be or what it would be about. I just like to feel my way through it, and decisions like this just kind of happen as a byproduct of the story itself. So, essentially, I let the natural flow of the story make such decisions. Which is cool because any amount of the work that I can shuck off onto the story is great because it leaves me more time for video games. 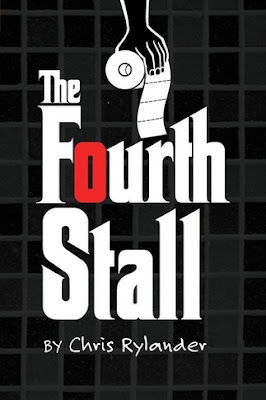 In writing THE FOURTH STALL, I realized about 40 pages in that making it too spoofy would make it cheesy and maybe un-relatable to kids because most them probably aren’t crime/noir aficionados. But also that it still had to have some elements from the traditional crime/noir genre to help create some action and mystery and tension so that it would hopefully appeal to kids in the same way that movies like "Chinatown' and "The Godfather" appeal to adults. I think there was definitely a fine line there, and I’m just really, really lucky that I happened to somehow stay on or near it without really ever looking down. Jordan: A lot of reviews point to Mac and Vince’s relationship as a strong point of the book. I feel like you did some great work on it during the editorial process, really digging into their friendship, testing it, bringing it a bit more front and center in the story. “Yeah, Mac, I’m telling you, that Derek Jeter is the greatest thing that has ever happened to the Yankees,” Vince said. With that, we both looked at each other and nodded solemnly in awe of Derek Jeter’s sheer greatness. Finally, I just had to be like, “give it up, Jordan, Jeter is completely overrated and overpaid and we all know it.” And then you finally agreed with me, which was awesome. Jordan: One of the things we talk about a lot on the publishing side is finding books that include characters from different backgrounds, but that the book isn’t an “issue book” about that difference. To that point, I love the way you deal with Mac and Vince’s background, growing up in the trailer park, class differences, all that, without letting it slip into After School Special territory. Chris: Yeah, I’m always paranoid about that, and am aware enough to try my best to keep things from getting too sappy or corny. Nothing takes me out of a story more as a reader than when I have to stop and groan or roll my eyes at something. So I’m always very critical of my writing to try and keep it as sincere as possible. And I try to write carefully around the emotion. I feel like just being straightforward and simple in regard to character emotions and touchy parts can help avoid the icky after school special sort of thing from happening. That, and keeping everything reasonable... I never want to have a character with a dad who left him, a mom who is a drunk, a teacher who is mean to him, a brother who beats him up, he’s missing a leg from a shark attack and also wears a hand-me-down jewel-bedazzled eye patch, and also has a disease which causes him to sporadically vomit on people while shouting obscenities about undercooked food. You have to keep characters’ "issues" realistic and grounded. And beyond all of that, I never wanted to write an issue book. I mean, my singular goal when writing this book was to entertain people. I just wanted people, kids especially, to have fun reading it. So that also probably helped me steer clear of this becoming a Lifetime Channel Original Movie. Jordan: THE FOURTH STALL is funny. How come? Chris: Honestly, it just came out that way. One time I tried to write a serious adult thriller about a guy who sets out to kill a bunch of dudes in a graphic, gritty, and horrific fashion. It was supposed to be like the ultimate revenge story. And then before I knew it, jokes were creeping in. A lot of them. There was one scene where he was basically torturing some guy, but they were both making jokes about giraffes and hula hoops and then Captain Crunch showed up and one of the characters mustaches started talking. I mean, I really just couldn’t help myself... humor is sort of my crutch when the going gets tough in writing. Most of the time, I’m not even trying to be funny... I’m just being me. Which now explains why everyone was always laughing at me before I became a writer--I always thought I just had a really weird looking face or something. Or maybe I always had food stuck in my beard and I just didn’t notice. But, another reason I think humor shows up a lot in THE FOURTH STALL is that I realized it needed to be that way to help offset the violence and realistic nature of the crime world I’d created. Stories that have any amount of gritty realism or tragedy, I think need at least a little humor to offset that. Otherwise, the book or movie or TV show will just be depressing and/or leave you feeling sick inside. But this topic also hints at how I knew I found my niche as a writer when I first started writing kids books… so many kids books are funny. Kids like to be amused and laugh (and adults do to, but sometimes forget that), and so writing a kids book just felt so natural, so right. Jordan: Kitten’s got to be one of my favorite characters in the book – small, quiet, smartly dressed, but underneath it all is a complete psychopath. You gotta tell the readers where he came from. Chris: He definitely seems to be everyone’s favorite! He is actually the one character in the book who is based totally and completely on a kid I really went to school with. He was in my sixth grade class and he did some insane things. He was actually probably even crazier than the character Kitten. One day he assaulted the principal and never came back to school. I did run into him at a party once years later when we were both 19 or 20 and he was way different. But he also seemed much less tightly wound, he seemed to have found himself… I guess I say that at the risk of sounding like a completely sappy nerd, but it’s true. Jordan: When are the Cubs finally going to make it to the World Series? 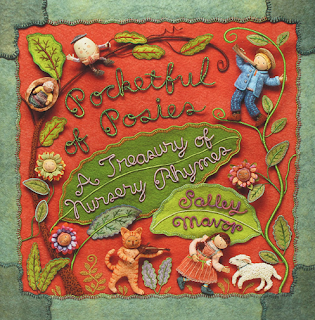 For this installment of my Winner Interview Series I talked with Salley Mavor who received the Golden Kite Award for Illustration for her book POCKETFUL OF POSIES: A TREASURY OF NURSERY RHYMES. Here she talks about how her work has evolved over several decades, explains her technique, and offers advice to illustrators who work in three dimensions. Please tell my readers a little about POCKETFUL OF POSIES. What drew you to the project? (And how many books have you done with Houghton Mifflin)? POCKETFUL OF POSIES grew out of a series of four nursery rhyme board books I did for Houghton Mifflin. The board books were so much fun that my editor, Margaret Raymo, and I decided to expand the concept into a broad anthology of nursery rhymes. Knowing that there are a plethora of such books on the market, we thought that my unique style and technique would set it apart. 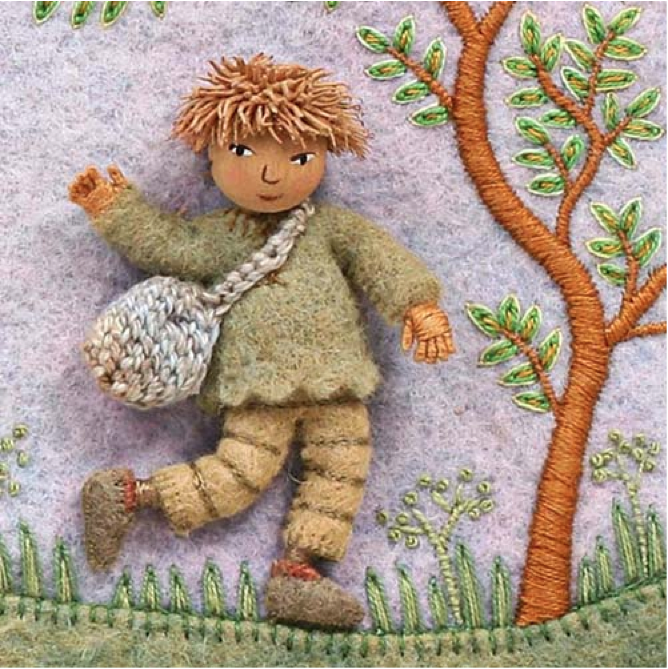 I had been gradually introducing wool felt to my fabric relief pictures before this, but these were the first illustrations made primarily with wool felt that was naturally dyed by a family business I found through my association with Waldorf Education. From the start, I was attracted by the idea of making one illustration per rhyme, of squeezing the action into a series of very different pictures, without having to repeat characters and environments throughout the book, as illustrators usually have to do in a story book. This would be an opportunity to include one-of-a-kind found objects that I wouldn’t normally be able to use because I couldn’t replicate or change the scale of the object throughout the book. I also thought that the variety of rhymes could hold my attention through the years-long duration of the project. Every page was completely different and fresh, making it possible to start over again and again, meeting a new cast of characters every few weeks. My first picture book, THE WAY HOME, came out 20 years ago and I’ve since worked with several publishers--MacMillan, Orchard, Candlewick, Harper Collins, C&T, and Houghton Mifflin. I consider myself to be an artist who sometimes illustrates picture books. 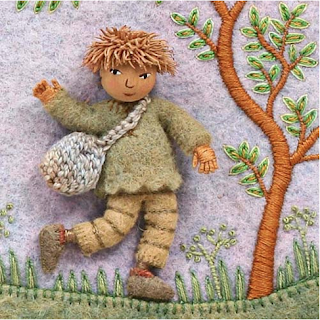 I spent 10 years designing, making and selling fairy kits for my business, Wee Folk Studio and wrote the craft how-to book for adults, FELT WEE FOLK: ENCHANTING PROJECTS. 5 years ago, I gave up the kit business in order to have time to sew the illustrations for POCKETFUL OF POSIES. You’ve been creating three-dimensional art professionally since the '70s. How did your early work evolve into a picture-book worthy technique? When and how did you come into the world of children’s book illustration? I majored in illustration at the Rhode Island School of Design 30+ years ago, but wasn’t sure that the dolls and assemblages I presented for critique would ever be a viable working method. I studied illustration because I liked narrative work and wanted the freedom to tell stories with a variety of mediums. 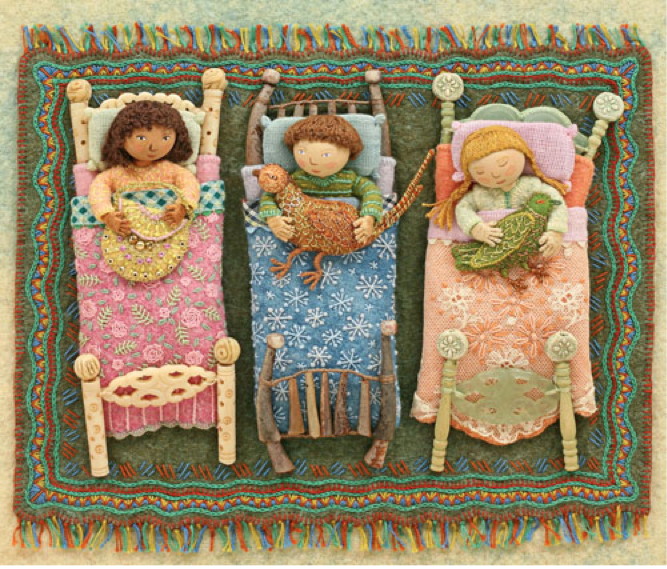 I’ve had a life long fascination with textiles and miniatures, and have sewed little things since my earliest memories. So, what I do today is just a continuation of what I’ve always done. When it comes to embroidery, I’ve taught myself everything through books and years of practice. 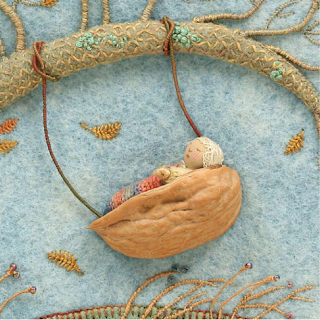 But stitchery itself is not dynamic enough for me, I like to decorate felt pieces and parts with embroidery and then combine them with other dimensional materials. 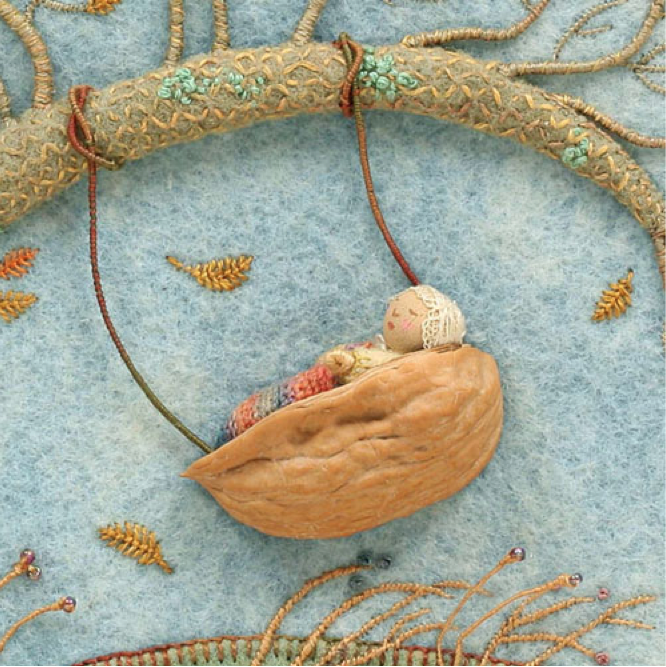 My 3-D work started as a kind of soft sculpture, which I would set up in scenes. Creating a way to photograph the scenes effectively was a challenge, so I started to incorporate backgrounds into my work. I essentially removed the back half of my dolls, sets and props, and sewed them to an embellished fabric backdrop, creating a shallow mini stage set. People asked me what it was called, so I made up the term Fabric Relief Sculpture. My husband, Rob Goldsborough started making wooden shadow box frames for the pieces and I found that my work was respected as “art” now that it could be hung on the wall. It took several years to develop this technique to a point where I thought it could be used as illustration. I visited several editors in New York, who liked what I was doing, but didn’t see how they could use it. One suggested I write or find a story and make some samples. Looking back, I can understand that my work was too unusual and idiosyncratic for the publishing world right then and that I wasn’t ready to take on a book project. I’d been making stand alone pictures and I wasn’t yet capable of visualizing a 32-page book. Also, during this time, I was busy taking care of my two young children, but I kept working at my craft, mostly in the evenings. My neighbor, Molly Bang, a children’s book writer and illustrator, showed me a wonderful elephant story written by another Woods Hole resident, Judy Richardson. After a few years of planning and gearing up, Judy and I felt prepared enough to present THE WAY HOME to a handful of editors in New York. We brought everything we could think of, a story board, a sample illustration, and a 4 x 5 transparency of the illustration. After that trip, we were offered the great opportunity to work with editor Phyllis Larkin and art director Cecilia Yung at MacMillan. Somehow, I found the time to stitch the illustrations in a year and half, even with all of my other responsibilities. In the early '90s, my friend and past illustration teacher, Judy Sue Goodwin-Sturges, started the design agency Studio Goodwin-Sturges. She started representing me and showing my work to the children’s book publishing world. Since we first met at RISD, 35 years ago, she has encouraged me to follow my urge to sew and stitch and supported my efforts to grow as an artist. Creating your amazing fabric illustrations for books seems to be a slow and meticulous process. Can you describe the time, techniques, and materials involved to give my readers an idea of how you work? Lately, I’ve been describing my work as part of a Slow Art Movement. Yes, it’s very time consuming and not very practical, but that is part of what attracts me to this way of working. I sew, wrap, embroider, carve and embellish in as many ways as I can think of—all by hand. I can’t really speed it up and machines are no help. Through the repetitive, tactile processes, I find a calm satisfaction that can help lead to effective problem solving. Each illustration requires figuring out something new, whether it is a way of constructing a driftwood house or making a tiny basket, so I need time to work things out. It took five years for POCKETFUL OF POSIES to go from early sketches to the final production stage. For three of those years, I stitched and assembled the 51 nursery rhyme illustrations. What kept me going was the challenge and excitement of bringing so many stories and characters to life. I could concentrate a lot of energy into each picture and make bold design decisions. I was determined that every rhyme would have the love and attention it deserved. I find that welcoming found objects into my work can become a trap. Some very interesting looking things can seduce me into thinking they belong in a picture. Later, if it doesn’t contribute to the story, I’ll have to make the painful decision to kick it out. That’s hard, especially when I really like the object. Writer friends tell me that they encounter something similar in their writing. They have to get rid of clever characters, witty dialog or funny situations that seemed perfect earlier. We agree that it’s all part of the creative process, but you have to be willing to see the impostor for what it is. People often ask how long it takes to make an illustration, but I’m not really sure, because time disappears when I’m working. I know that it takes between two to four weeks per picture, but as to the hours, I don’t keep track. 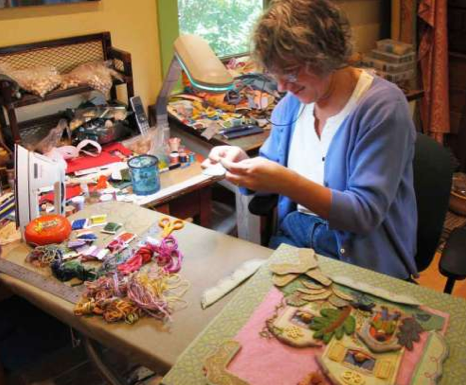 My husband, Rob says that when I’m not eating or sleeping, I’m working in my studio. Of course, this is not entirely accurate, but it’s close to the truth. I admit to being obsessed with making things, as I believe are most artists. Holding a threaded needle is my default position. Adults comment on my detailed, labor intensive technique, but children are not impressed by how long it takes or how perfect my stitches are. No matter what technique I use, or how many days it takes, my goal is to stimulate the imagination and have children emotionally connect with my art. How did you feel when you learned you won the Golden Kite Award for Illustration? I was totally surprised to find out that my book was chosen. I feel honored and recognized in a very special way by my peers. For 20 years I’ve felt outside of the mainstream of children’s books, that my style didn’t really fit and was more of a novelty. I hope that my book will encourage more illustrators, art directors, publishers AND children to see the creative possibilities in even the smallest things around us. I’m also grateful that the award may help give POCKETFUL OF POSIES a longer life in this competitive market. Can you offer some advice to artists who work in “alternative” media in regards to approaching publishers? To artists who work in a 3-dimensional medium, I would say that your portfolio should show how your work reproduces onto the printed page. Include good quality, well lit photographs that bring out the unique appeal of what you make. As in any medium, publishers want to see that you can create engaging, active characters in environments that children understand. If you are working with fabric and stitching, make sure that the photos bring out the details of your work. Don’t make your originals much bigger than the printed size, because the textural quality is lost in the reproduction. 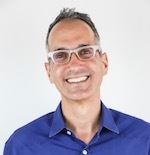 Have your photos show the raised texture and sculptural quality of you medium. Otherwise, you may as well be working in paper collage or paint. Bringing characters to life in three dimensions can be a challenge in picture books, but it is key to successfully illustrating a story. Many sculpted heads I’ve seen tend to have exaggerated features that come across as grotesque and not appealing to young children. This style may be more appropriate for editorial illustration, adult books or advertising. Please tell us about upcoming book projects and exhibitions of your work. Right now, I’m taking a break from illustrating and will be spending the next few years making pieces for art shows. I’m not even sure what I’ll be making, but I feel like I have something to contribute outside of the children’s book world. 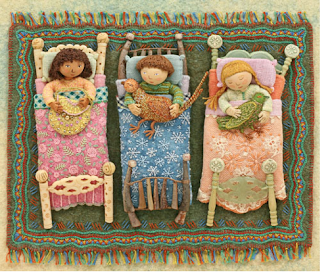 The original fabric relief illustrations from POCKETFUL OF POSIES are touring around the country through December 2013. The next location will be at the Muscatine Art Center, Muscatine, Iowa from April 23rd to June 18th, 2011. The schedule is frequently updated on my blog.